On 17 March, Bahrain Institute for Rights and Democracy’s Advocacy Associate, Amanda Milani, delivered an oral intervention at the 28th Session of the United Nations Human Rights Council in Geneva under Item 4 on human rights in Saudi Arabia. Please continue reading for full remarks or click here to download a PDF. 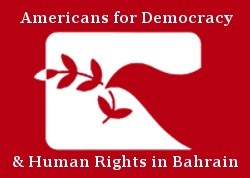 Americans for Democracy & Human Rights in Bahrain would like to raise our deep concern over failures in the Saudi judicial system, which continue to restrict the rights of women, human rights defenders and voices of dissent. The Saudi judicial system offers women limited legal and domestic rights. For Saudi women driving a car is only a distant possibility while the Kingdom’s Guardianship System renders women legal minors before their male relatives. In the past year, Saudi authorities have increasingly tried human rights defenders as terrorists. In January 2015, an appellate court upheld Waleed Abu al-Khair’s 15-year prison sentence under new anti-terror laws, used systematically to silence dissent. Abu al-Khair’s wife Samar Badawi, today cannot speak on her husband’s behalf as she remains under travel ban since her attendance of the 27th Session of the Council in September. This form of reprisal by a member of the Council is totally unacceptable. Other human rights defenders and activists, including Mohammad al-Wadani, Tawfeeq al-Amer, Mohammed al-Bjadi, and Raif Badawi, have also been imprisoned, tortured, and placed under travel bans. Mr. President, how can a member of the human rights council permit arbitrary detention? According to Saudi law, the Saudi Bureau of Investigation and Prosecution may detain a person without trial for up to 6 months and restrict their communication for up to sixty days—maximums that are often treated as minimums. Activists Baheya al-Rashoudi, Khalid al-Johani, and Nayef al-Man have all been detained without trial for over a year. Saudi courts also hand down disproportionate, cruel & inhuman punishments. In November 2014, the Specialized Criminal Court also sentenced Mikhlif al-Shammari to 2 years in prison and 200 lashes for visiting a Shia community. In October 2014, Sheikh Nimr al-Nimr was sentenced to death by beheading. The Saudi government has beheaded more than 20 people since the beginning of 2015, a number which amounts to already half of the total beheadings of last year. Given these observations, we call on the Council to constructively engage with the Kingdom of Saudi Arabia in encouraging effective and expedient human rights reforms, particularly with regards to its legal and judicial system.